What more can we aspire to, but shelter, food, water and warmth for all – guaranteed? The great Thatcher sell off of private assets, of energy, water, and transport under the guise that privatised means good, and public ownership bad may have fooled a blinkered few in the 1980s but the vast majority of the public know it has failed, and failed miserably. Important, vital utilities such as these should be under democratic control, and public ownership is a popular way of achieving this. It is scandalous that food and water can be treated as commodities to be gambled with. This was the Ultimate Theft. It has been a disaster, and there is widespread public support to bring these Utilities back into public ownership and democratic control. 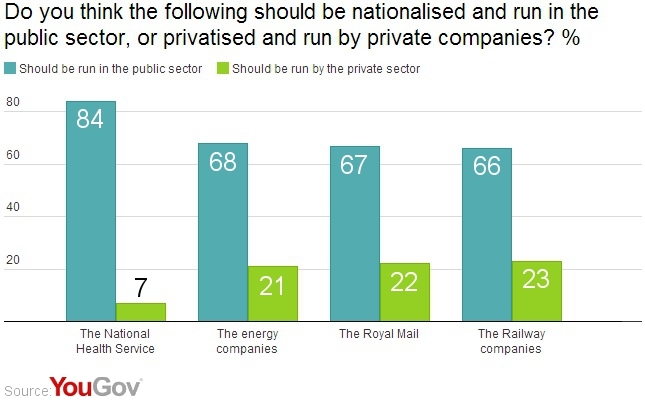 YouGov’s poll shows wide public support for renationalisation of these utilities. Labour should not be running scared because the press says so. 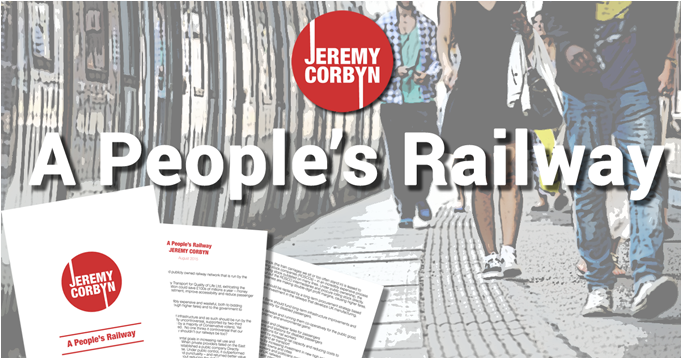 Today, Jeremy Corbyn announced his plans for a People’s Railway. Jeremy plans to replace the rolling stock companies (ROSCOs) with a long-term procurement strategy based on strategic long-term investment in the railways to boost manufacturing, skills and jobs across the UK. He will oversee a process which will ensure that all parts of the railway networks work together for the common good – with strategic management representing the industry, government (local and national), passengers and workers. Once again Jeremy’s Vision of a new National Investment Bank is focussed as a source of public investment which will enable a co-operative model of public ownership and fund long-term infrastructure improvements and increased accessibility for disabled passengers. Give passengers, rail workers and politicians more democratic say over the strategic development of UK railways. As Jeremy Corbyn has proved many times, he has the clear vision which the Labour Party – and this country need to find a way forward for people, and for a caring society. Don’t be scared and timid. This beautifully written article presents the panic of some politicians as fearful, reflex actions take precedence over considered thought. Why then, are so many in the Labour Party clutching at neoliberalism and trying to make Corbyn out to be an extremist? His policies are moderate and socially desirable. “The latest explosion of ridicule and indignation finds its target in Jeremy Corbyn daring to speak about ‘public ownership of some necessary things‘. Media is abuzz with ideologues, lexical hair-splitters and supercilious interpreters making great effort to draw attention away from any constructive debate. If public ownership of natural monopolies had been advocated as a vehicle of Cameron’s Big Society I wonder whether the response would be this inane. Clause Four! Clause Four! Oh, my good gods but the hysteria and vitriol, from both political wings, is woeful and tedious in its predictability. The capacity to focus in on the least relevant aspect of a message is remarkable. Clause IV (commitment to the “common ownership of the means of production”), re-nationalisation, pre-distribution, mutualism, socialism… Really, I don’t give a rat’s arse for the semantic games and the expedient framing they afford. The concept matters more than a loaded label, right now and ‘public ownership’ is an appropriate description. I care about the intention behind socio-political ideas, the mechanisms employed in manifesting them and their socio-economic effectiveness. Personally, it’s neither here nor there, to me, whether Labour feels a need to officially re-establish the principle behind Clause IV into its ethos. That’s for the Party to wrestle with. I am just glad that Corbyn is putting the basic principle front and centre. As I’ve written, several times, over the last couple of years, I’d like for essential utilities and services, for example: energy, water, health, education, public transport.. to be in public ownership. You know: those upon which we all depend for national prosperity and personal well-being. How such public ownership is achieved, at this late stage, is probably going to vary according to entity, current systems, rational and legality so I’m not pretending that there’s a magic, one size fits all formula. However, the debate needs to be had. Rightists may have ‘won’ the argument once, a couple of generations back but it didn’t follow that they were wholly correct, did it..? Why would the population of a country wish to create public ownership of those utilities and services deemed so essential to a civilised and prosperous Society? Why would such a population choose to hand over such responsibility, accountability, control and profit to (often) mercenary, private corporations? Why is it named ‘aspiration’ when it comes to the traditional reasons for individuals wanting to own their houses or to be self-employed/entrepreneurial but it is called a regressive notion for a whole nation of individuals to scale this up and share the responsibilities and rewards of collective interest? Action for Rail – No to McNulty. Yes to Renationalisation. The Action for Rail (3) Campaign presents the arguments on the day of Action from the TUC and union leaders of RMT, ASLEF and TSSA outside Euston Station. TWENTY THOUSAND JOBS WILL BE LOST. PASSENGERS FACE MASSIVE RISES IN FARES. The privatisation of Railways by John Major’s government has been the most unpopular transport policy for a generation. Opinion polls point to over three quarters of the electorate supporting re-nationalisation of Railways. New Labour missed an opportunity to bring back railways and other public transport back into democratic ownership. As a consequence, users are now facing the highest fares in Europe and face further massive increases if the McNulty plans go ahead. As part of its plans for the future of the rail industry, the government is asking train operating companies and Network Rail to outline how they will make cost reductions in line with the recommendations of the Rail Value for Money review led by Sir Roy McNulty. More than a quarter of these savings – £260m a year – will come through staffing cuts. According to the McNulty Review, this could lead to around 20,800 job losses, including rail guards, staff in ticket offices and on station platforms, catering staff and workers in maintenance and signalling. However, the unions say surveys consistently suggest that a lack of staffing is one of the key concerns of rail passengers, and more than 10,000 commuters and train users have so far registered their opposition to staff cuts in response to union campaigns. The McNulty Review calls for the closure of 750 Category E (or small-staffed) station booking offices around the UK. Leaked Department for Transport emails indicate that agreement has already been reached with one train operator, London Midland, to completely close or severely reduce opening hours at ticket offices at 86 of its 90 stations, leaving many deserted at all hours and leading to the loss of around 100 staff. We strongly urge you to respond arguing for nationalisation not this supra-franchise. Think Left supports Action for Rail (3) and renationalisation of the railways (8) and public transport. Privatisation of rail was the last privatisation of the Thatcher/Major Conservative years, yet sadly we are now witnessing wholescale privatisation of public services including health and education – despite very clear evidence that putting profit before people by privatisation of utilities and public services costs lives, jobs, and does not provide improved services. 2. Union News UK: Action for Rail -joint Campaign against McNulty Closures.